Three decades after the Ocean Shore Railroad declared bankruptcy and pulled out of the Coastside, the train’s right-of-way was paved over with a new road, eventually called Hwy 1. The paving occured in stages up and down the Coastisde, between the 1940s and 50s. 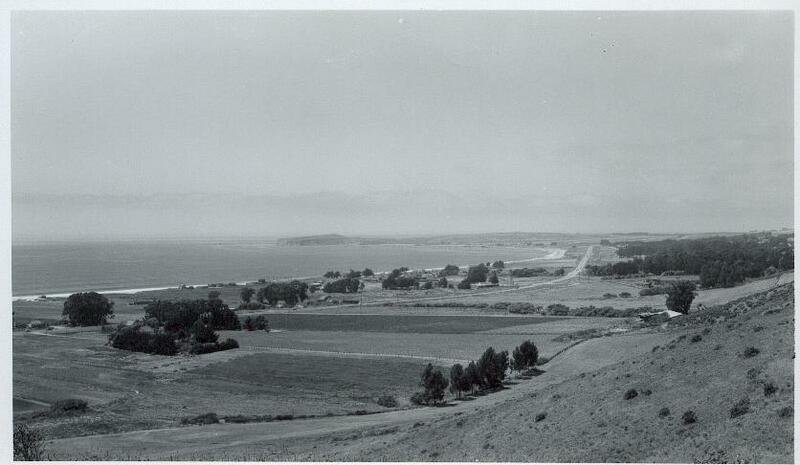 This R. Guy Smith photo could have been taken in the early 1950s–when development was taking place on “the other side of the hill” but not on the Coastside, still wide open. In this picture it seems the Ocean Shore left us little to remember it with. But if you look closely some landmarks are visible such as the old Amesport Pier (1860s, rebuilt 1916) at Miramar. That’s Pillar Point to the north. Notice there’s no traffic? What’d they do, close the highway so the photographer, R. Guy Smith, could get the shot? Nice.